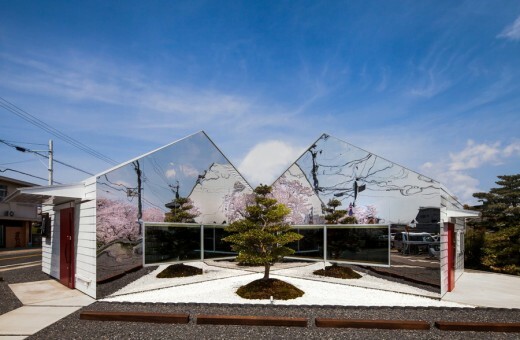 Mirrors is a roadside cafe designed for a plot by side of a row of cherry trees. The building has two wings and looks as if it has split in half symmetrically and arranged around a single Camilla tree, which stands on a patch of white gravel with tile edging. 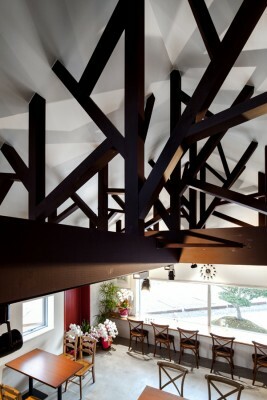 Internally, vertical roof struts of motif of the tree blanch make visitors feeling of a rest under the tree. 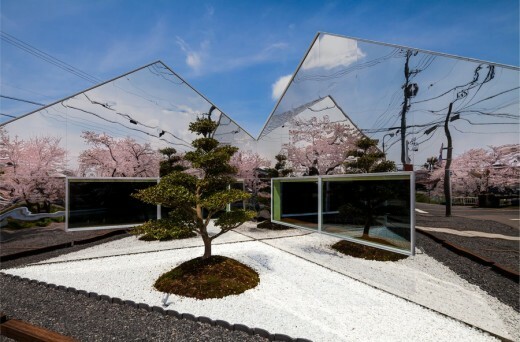 A bank of cherry blossom is mirrored by the reflective gables. 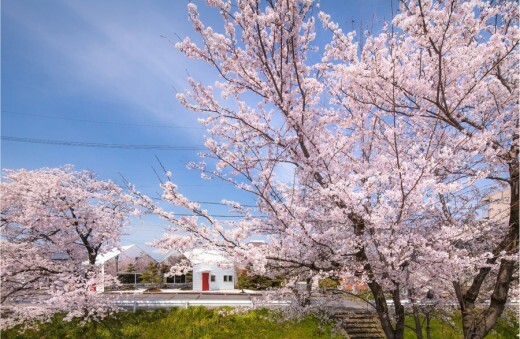 This feature creates a cherry forest in this residential town. Mirrors is running for all seasons. In the early spring the cherry blossom viewing season has come, and Mirrors creates the cherry forest. After that, Mirrors reflects green foliage. In the fallen leaves season, the camellia’s flower comes out. As a result, the plot of the mirrors impresses on the visitors not only cherry blossom but also sensitive changes of the four seasons. The project started in 2013 and finished in 2014. 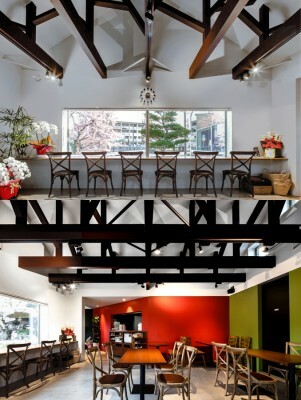 The cafe is located in Gifu prefecture, Japan. The two gables made of polished stainless steel are angled towards each other, reflecting both the adjacent tree and the cherry trees. Internally, visitors sit under the vertical roof struts, motifs of the tree blanches and catch simultaneous view of both the reflected and real scenery through wide picture windows in each gable. A row of cherry tree is planted at an embankment at the basin, and many people visit this location during the cherry blossom viewing season. Taking advantage of the location, Mirrors has unique appearance and invites the people, and Mirrors reflects this environment for all season. As a result, the objectives are awareness of transition of the season and coexistence with nature. Mirrors was planned for promotion of the cafe business under the circumstances. 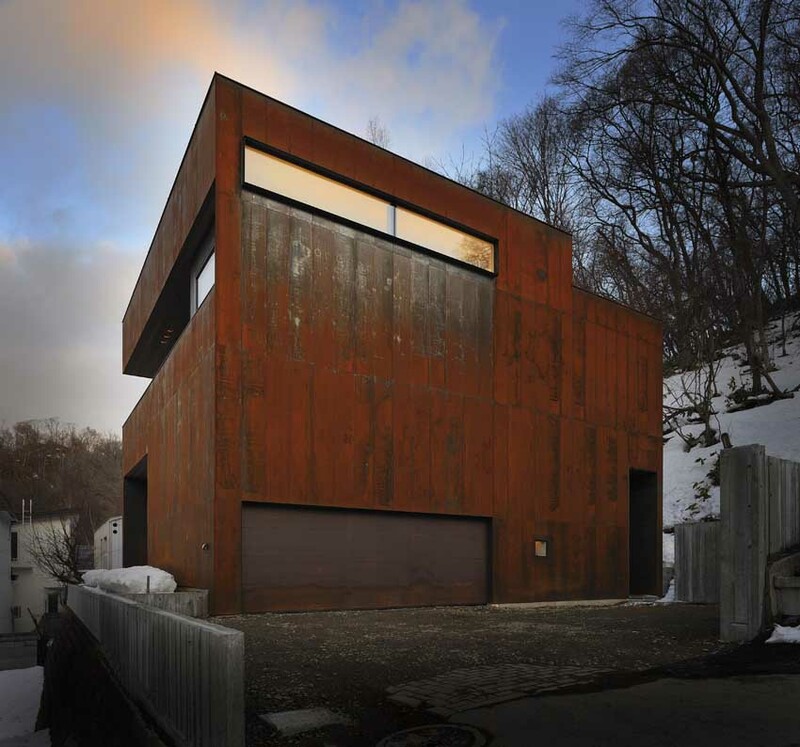 In this project, our great concern was how reflection of stainless steel effected to the environment, people and others. We especially took care about obstruction for car traffics and neighbors. The reflex action doesn’t turn toward to theirs, and this low rise building hardly impact the entire environment. 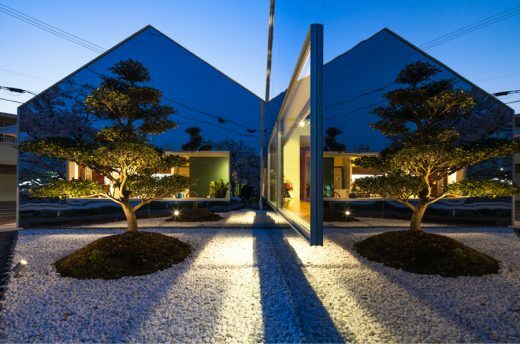 In overcoming the obstacle the reflection bring various benefits for the cafe. 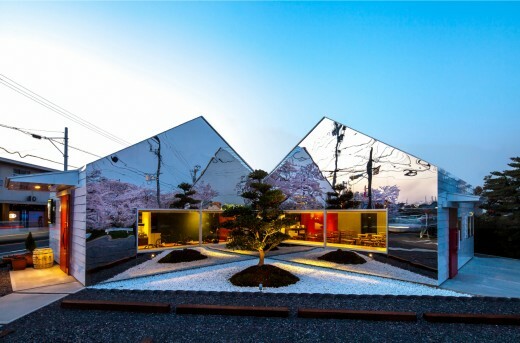 Career: 2007	Started bandesign 2006	West Forth Architecture New York 1992 – 2004	Nikken Sekkei Ltd.
Mirrors Cafe by Hisanori Ban is Winner in Architecture, Building and Structure Design Category, 2014 – 2015.